Just like the previous games you go around and try to survive for a few days and use anything you can find as a weapon. If it is not bolted to the wall or floor chances are you can use it. 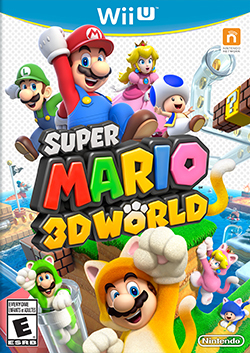 The game plays like all the other "3D" Mario games. It's fun, challenging at times but the end result really pays off. Just got to remember to collect as many green stars as possible. This game got a lot of bad reviews from critics and fans. I however thought it was great. In the last game "Arkham City" fans were crying because they wanted more game play, well this is basically the same game and game play so I don't know why people didn't like it. The story is great, boss battles are tough but manageable, and overall a fun game. Katie and I have spent so many hours playing this game I refuse to say how many hours. It is just a very additive game. When you stop and think about what you are doing in the game you feel sad knowing you are wasting your life away playing a life simulator game. A great upgrade to one of my favorite Zelda game. Originally released on the Nintendo GameCube this HD remastered game brought some things new to the game to make the pace of the game go by a little bit quicker and less of a hassle in some quests. Great looking game, great story and fun game play still makes this one of my favorite Zelda games. The past few entries on my lists showed the Call Of Duty games on my worst of lists. I somehow found this game to be enjoyable and fun to play. The story is still hard to follow but for once in a few years I enjoyed a Call Of Duty game. A remake of the original NES game with the same levels remastered, however all the secrets you remember from the original are still there. The game has a story this time around and features the entire cast of the 90's cartoon. The boss battles are a little different than the original so you have to figure out their new patterns. From the people that brought you Mortal Kombat comes this game featuring the DC Comics universe. It is fun being able to play as Batman fighting against Superman. How that is even possible I still have no idea. Wouldn't Superman just be able to walk up to Batman and stop him? Everyone had their hopes up for this game. From previous trailers and game play reviews this was going to be the coolest Alien game out there. However it switched developers and got ruined in the process. It is a glitch mess, Aliens get stuck in the walls and your A.I. companions get lost and stuck in doorways. The story is also very weak. You would think a game based on the hit T.V. show would be a good game, wrong. The idea is kind of cool, you play as Daryl in this first person shooter and you are with your brother Merle, and you start to witness the beginning of the zombie outbreak. It even features the voices of the actors as well, but just like Aliens: Colonial Marines it suffers from game glitches and a lack luster story. I love the Gears of War series but for some reason this game just felt boring and repetitive. I had to stop playing 3/4 of the game just because I was so bored. Another game that I loved the original of but this time around it just felt like a chore to play it. Sega's attempt to put Sonic in a game that feels like Super Mario Galaxy and failed at every point. A retelling of Superman's origins. The story was really good, they made it different from the previous movie story lines which is fun to see. Only complaint I have is there is way too much destruction. This felt like the year of the White House being taken over, and out of the three this one really stood out to me. It had a fun story, good action, good characters and an awesome cast. Based on a true event that had happened a few years ago, I really did not think I would like it due to knowing how it ends but I really did enjoy it. The cast did a great job and was fun seeing how it was like instead of reading about it. This movie only made my list because of ONE reason. It was 100X better than the original film. It felt more like a G.I. Joe movie where as the previous one just felt like a super soldier movie. Great collection of lovable G.I. Joe characters. The story isn't the greatest but I really enjoyed it. Like I said it only made my list because the first one sucked. Thank God this is the last Hangover movie! I can't believe I was able to watch the entire thing. I do not know how such a fun film the original Hangover was and how it spawned two of the worst sequels I have ever seen. The "Dark Knight Rises" of the Iron Man series. Boring, hard to sit though and just wished it would end. The movie's story felt like it had something going for itself but then some dumbass said "hey lets add Bruce Willis and make it into a Die Hard movie". I really do not know if that is true but it sure felt like it. All I can say about this Will Smith and son movie was boring and a waste of my precious time. Another movie that has a terrorists group taking over the White House. Although I liked Olympus Has Fallen this movie was just awful.